Everything about our hands says something about us, whether it's the shape or length of our fingernails, but most importantly (at least in Palmistry) are the lines on our palms. The main lines are the Heart line, Head line, Life line, and the Fate line. These don't predict your future, but they go more toward the quality of life. For example, the Life line doesn't say how long you'll live but the kind of life you'll lead; the Head line doesn't indicate how smart you are, but how you think. But the Heart line is unreliable, so don't count on it to give you any helpful advice for your relationships. 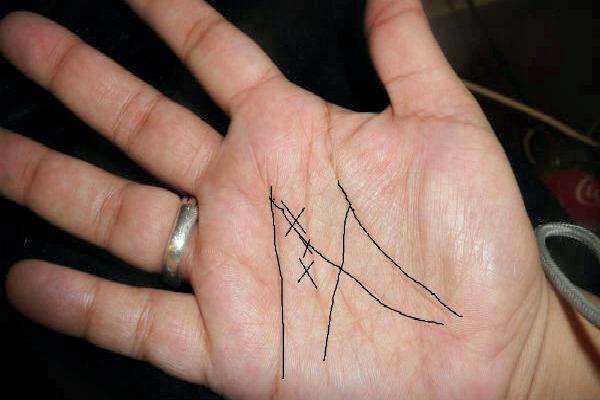 However, if the lines on your palm intersect in such a way that they form an M, then this indicates that you're a gifted and very special person. Having the M on your palm is supposedly very rare, but I have it on both so I'm guessing it's not that unique. This marking is believed to be an indicator of not only good fortune, but success in almost everything the person endeavors to do. Those with the M possess entrepreneurial skills, fantastic intuition, and have the ability to make a lot of money at almost everything they do. Oh, and that intuition makes them human lie-detectors, so whatever you do, don't try to con them. But there's a catch: if you're right-handed, then the M mark should appear on your left hand, and vice versa. Since much of Palmistry is dependent on whether you believe in it or not, I'm going to choose to believe. Instead of nullifying the great and grand qualities that having an M brings, having it on both palms doubles it.